Jeweled Wild Rice is a joyful gluten free vegan recipe and a make-ahead friendly side dish for the holidays. Serve cold as a grain salad or as a warm pilaf. Put the wild rice into a large bowl with the onion and celery. Whisk together the dressing ingredients and taste to adjust any of them to your liking. Toss the rice with enough of the dressing to moisten thoroughly. Be sure to stir the dressing first if it has separated. Toss the rice with the dried fruits and nuts. You can now chill the rice if you are not serving it warm. Can be made up to 2 days in advance. When ready to serve, toss with more dressing if necessary, and arrange on a bed of baby arugula or micro-greens. 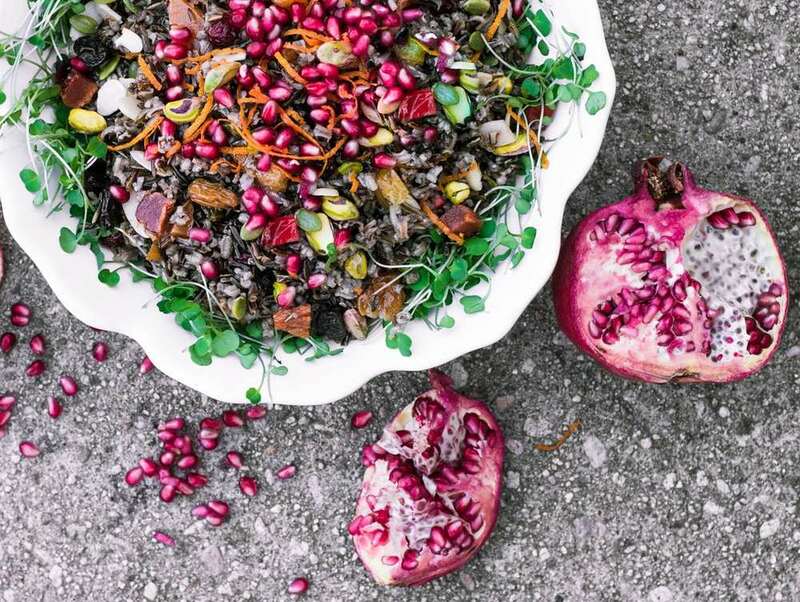 Garnish with the pomegranate seeds.